The Life Fitness Training System GS4 offers an even wider selection of exercises for training the entire body so you never get bored during workouts. The GS4 features the reliable quality and ergonomics that Life Fitness is known for. Studio quality and finest materials - now at a bargain price! The Parabody Training System G2 stands out from other fitness equipment through the new Variable Arc press station, with which you can do more exercises in less time. The Parabody GS2 features the reliable quality and ergonomics that Life Fitness is known for. The Cable Motion technology of the Life Fitness G3 Gym System enables you to train with a variety of different, natural exercise movements; in addition to sport-specific training, all primary and secondary muscle groups can get targeted conditioning. 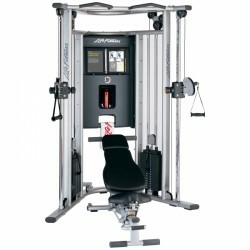 Successor of the Life Fitness Weight Station G5 For functional training. High-quality design provides continuous enjoyment during workouts. 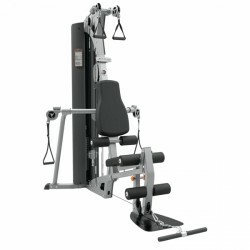 When you buy a Life Fitness multi-gym, you know what you got: Life Fitness is a leading manufacturer of high-quality cardio and strength machines. Multi-gyms of Life Fitness have been established at fitness facilities of ambitious sportsmen for a long time. Thanks to its versatile training possibilities, these multi-gyms are the ideal alternative for persons who prefer an effective muscle building training at home in order to avoid the often loud background noise at a gym. Which advantages does a Life Fitness multi-gym offer? Get real commercial quality at home purchasing a Life Fitness multi-gym. Being designed for the needs of ambitious sportsmen, the home gyms of Life Fitness offer several multi-gym exercises, which are required for an effective whole body training and an even muscle building. The training with a Life Fitness multi-gym is also optimal for reducing weight. Being an ideal addition to cardio training, you can burn many calories, when you train your muscles specifically and thus increase their energy need distinctively - even beyond the actual training. The ergonomically shaped upholsteries provide a special comfort and high stability and give you a comfortable and safe experience while exercising. 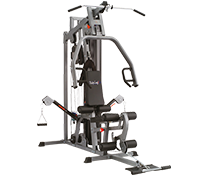 In addition, Life Fitness emphasizes its position as manufacturer of premium fitness machines of an outstanding quality of frame and joints of your home gyms. Which Life Fitness multi-gym is best suitable for which user? Life Fitness multi-gyms, which mainly work with guided movements, are great for beginners. 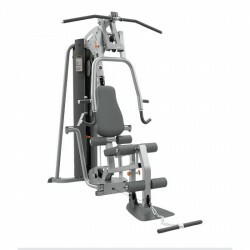 Models like the Life Fitness multi-gym G2 are the ideal machine for starting strength training. Using the Life Fitness multi-gym G2, the user does not need to think about the correct accomplishment of the strength exercises. Risks of injuries are reduced doing a guided training and optimal training progress is made possible. Multi-gyms like the Life Fitness G7, which are equipped with pulleys respectively cable pulls, are well for advanced users. Even experienced sportsmen can set effective training stimuli with the Life Fitness G7, because strength training exercises on the cable pull have a higher coordinative demand. This type of training consides complex types of sport as well including their specific demands. Thus, just improve your golf swing or your tennis forehand effectively with a Life Fitness multi-gym.